Oh how lucky you are to be chosen by such lovely ducks. Lol...they know theyll have to get used to the camera if theyre staying as they did last year Jacque.! It willbe pointed at them every opportunity ! It's a lovely picture of two lovely ducks. That IS good news! I bet you were thrilled to see them! BRILLIANT - they are back. They will be nesting soon! how exciting!! Hi Dawn..third day in a row now.They still fly off at night at the moment,but always there at tea time waiting after work for their supper ! Great, its amazing how they return to nest isnt it. I hate it when they leave after they have reared their young but still nice to have them for a while. Thanks Flower - spending longer here and showing no signs of leaving tonight had 12 ducklings last year , they actually moved in as laying the pond liner and used to stand on it as if to say hurry up and fill this please. Will do Ams but they not too fussy and seem quite happy to undertake whoopee on the pond right under your nose ..
Glad to hear that :-) Remember my two? They have not returned, but I've seen a pair flying about the place - wonder if they are the same pair? Hope they are Sid..sure if they land theyll recognise you ! 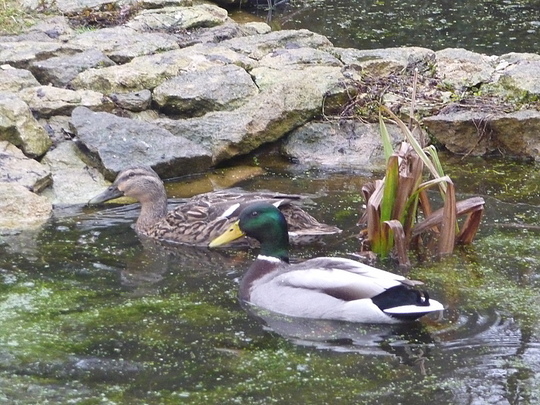 I'm watching out for them.......it about April when they arrived last year tho - just after I'd finished my pond. Ditto Sid ,urs arrived end of April,just as new pond about to be filled.Reckon they have come earlier this year to re claim it before any others arrive !